How To Make Pancake With Simple Recipe- Hello everybody, welcome back with ZetiraKitchen! Today I will share about how to make pancake. Pancakes are foods made from flour, eggs, sugar and milk and then mixed into a mixture that will be cooked in a hot frying pan. Pancakes are usually eaten as breakfast with a cup of tea. The sweet taste and the delicious toppings on top make everyone gonna love it. Pancakes have been known since Roman times. They call "Alita Dolcia" which means sweet food. 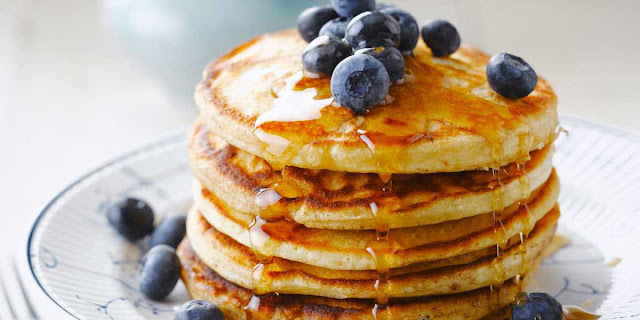 Usually, Romans eat pancakes with honey or fruit syrup. In each country have different characteristics of pancake. As in Germany, pancakes are made in a more dense form and made from potatoes called pfannkuchen. In France, there are thin and crispy pancakes called crepes. There are also more fluffy and thick galettes, like bread. So, what kind of pancakes are we going to make? Pour flour, sugar, salt, and baking powder into a bowl then Stir well. Add the mixture of eggs and fresh milk. Stir until the mixture mixed well and soft. Add melted butter in mixture and stir again. Cook the pancakes until looked some hole in the dough, it means we must flipping the dough. wait a minute moment and lift. Served your pancake with maple syrup and add some fruits in over there.